Gamma Solutions introduces the Zebra ET50/ET55 Enterprise tablet with highly flexible features and specifically designed to handle all day, everyday use. 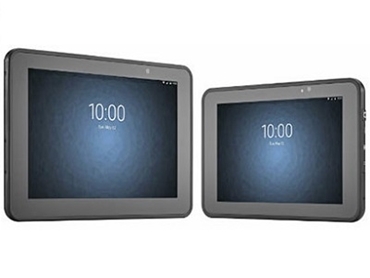 The ET50/ET55 Enterprise tablets offer a choice of 8.3 inch or 10.1 inch display sizes, Android 6.0 or Windows 10, and connectivity anywhere in the world with a robust wireless connection on the world’s fastest data networks. Count on the ET50/ET55 for true enterprise-class data capture, and optional advanced imaging engines to capture any 1D or 2D barcode. Key features include an integrated 8 megapixel rear camera designed for the capture of images and a 2 megapixel front camera for video calls; rugged design to handle all day, everyday business use, standing up to drops or exposure to rain, snow and dust; and Corning Gorilla Glass 3 allowing the display to better survive events that commonly cause glass failures. The ET50/ET55 includes Google Mobile Services, which provides integrated applications such as Gmail, Google Maps and Google. The ET50/ET55 also has an industry-leading display that allows workers to choose their preferred data input mode from gloved, un-gloved or stylus options. “With a USB charging connector or a 4-slot optional battery charger that utilise the same cradle to charge both models, the ET50/ET55 offers non-stop productivity and reliability,” says Gamma Solutions Northern Region Manager Hylton McCabe.